Beef jerky is just delicious and it is one of my top favourite dried foods. Whenever I travel or go on hikes, I make sure I have some beef jerky with me. I can eat jerky as a source of instant energy and also use it in the dishes that I make while I am on the trail. You can use beef jerky in almost any dish that you choose to cook while you’re hiking or camping. Beef jerky rehydrates quickly, and it can add a delicious taste to dishes involving rice, noodles, or pasta. Recently, I tried making a gluten-free beef jerky recipe in my new jerky dehydrator. This gluten-free recipe is easy to make and it will give you beef jerky that tastes delicious and is nutritious as well. 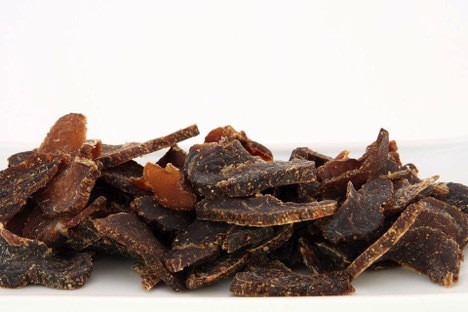 You can eat this beef jerky as it is and you can also use it in various dishes that have a liquid ingredient so that the jerky can rehydrate properly. Most of all, beef jerky is easy to carry while travelling and it gives you a healthy way to recharge yourself after you’ve been walking and trekking all over. So, let’s not wait anymore and take a look at this gluten-free beef jerky recipe. 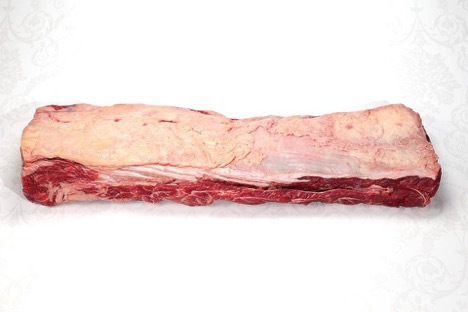 1) Slice the Beef – Use a sharp knife to slice the beef into thin pieces or stripes. You can also ask your local butcher to slice the beef for you, but if you need to do it on your own, it’s very easy. Simply freeze the beef for 20-30 minutes as it is much easier to slice frozen beef. You can also use a meat slicer to thinly slice the beef into even pieces. Remember, the duration of dehydration depends on various factors and the thickness of the beef slices is one of those factors. The thinner you cut the slices, the less time it will take for the beef jerky to be prepared in the dehydrator. 2) Prepare the Marinade – Mix the ingredient for marination in a bowl and stir until everything is mixed well. Add the meat slices to the mix and toss it around so that the marinade is properly applied to the meat. Add the slices to a plastic ziplock bag and let it marinate overnight. 3) Dehydrate the Slices – By morning, the slices would have soaked up the spices and flavours of the marinade. Take the slices out of the plastic bag and place them on a dehydrator tray. Make sure the slices do not overlap each other. Switch on the dehydrator at 155-160 degrees F. Let the beef slices dry for 4-5 hours and check the pieces for pliability. If the pieces still feel soft and spongy, let it dry for a few more hours. The final product should bend slightly and then break when bent too much. 4) Store Your Beef Jerky – Always store your beef jerky in an airtight container so that it does not absorb any moisture. You can also place some paper towels in the jar that you use to store the beef jerky so that the towels can absorb any moisture. You can later move the beef slices to an airtight jar. You can cut the beef slices with or against the grain and it will provide you with different looking slices that will cook just the same. If the meat has any fat on it, it will spoil sooner while it is stored. So make sure you remove any fat while you’re slicing the beef. Properly stored beef jerky can last a few months when placed in a refrigerator and it can last about a month if stored on shelf. Make your jerky accordingly so that you won’t have to deal with spoiled jerky. You can change the quantity of jerky in the recipe by using the rough estimate that 3 lbs of beef will provide you with 1 lb of dried jerky. So, this was a simple and easy to follow a recipe for making beef jerky in a dehydrator. The timings for drying of the jerky can vary as these depend on a range of factors like weather and humidity in the air. 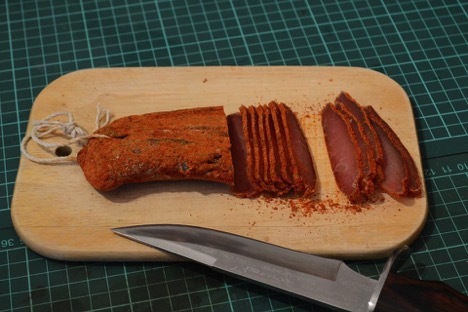 You can simply pick and piece and check if the jerky is properly dried by bending the piece. If it is still soft, it needs to be dried more. When a piece can be bent with ease, you can be sure that your beef jerky is just about ready. Have fun dehydrating! Hi there! I am Linda! I am a housewife and Chief Editor at DehydratorBlog.com. I have always been interested in cooking and eating a healthy diet. I felt that there is very little information out there about the advantages of dehydrated foods and that’s why I started my blog; to increase awareness about dehydrators and dehydrated foods. Please visit my blog for more information or simply leave a comment on any of the posts on my blog to get in touch! I’d love to hear your ideas about the kind of posts you’d like to see on my blog.